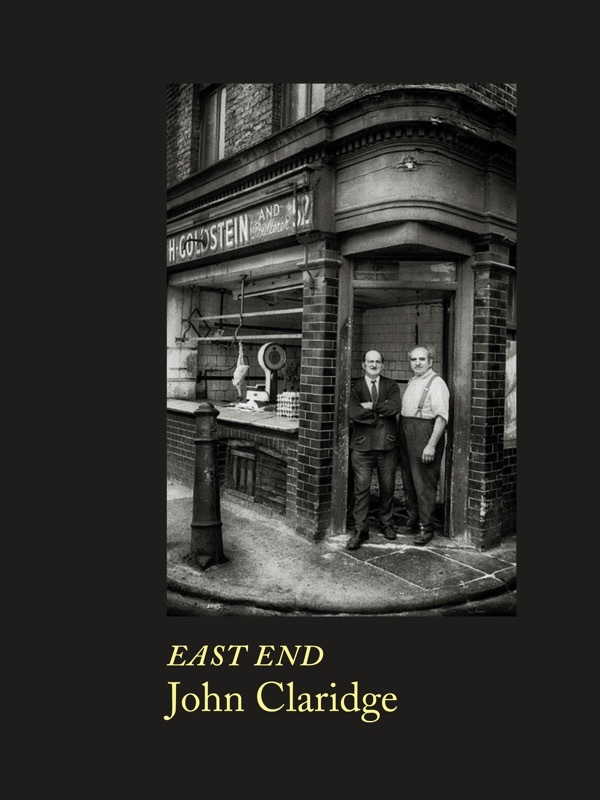 Thursday 2nd June : BOOK LAUNCH PARTY for John Claridge’s EAST END from 6pm upstairs at THE FRENCH HOUSE, 49 Dean St, Soho, W1D 5BG. Friday 3rd June : JOHN CLARIDGE IN CONVERSATION talking about his EAST END photography with Stefan Dickers at 7pm at WATERSTONES PICCADILLY, W1J 9HD. Emailpiccadilly@waterstones.com to reserve your free ticket. 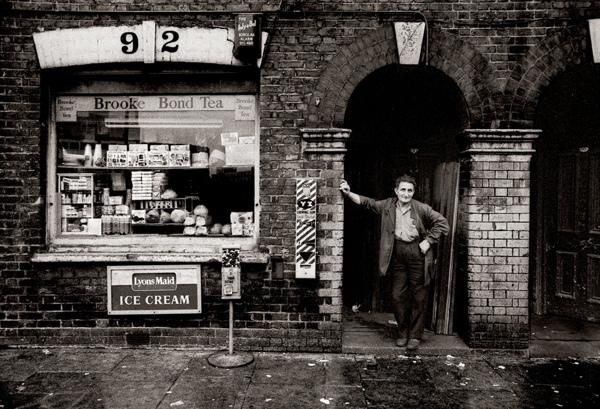 I took an advance copy of John Claridge’s EAST END over to show my pal Paul Gardner, fourth generation proprietor of Gardners’ Market Sundriesmen in Commercial St, and he laughed when he opened the book and saw the first double page spread. 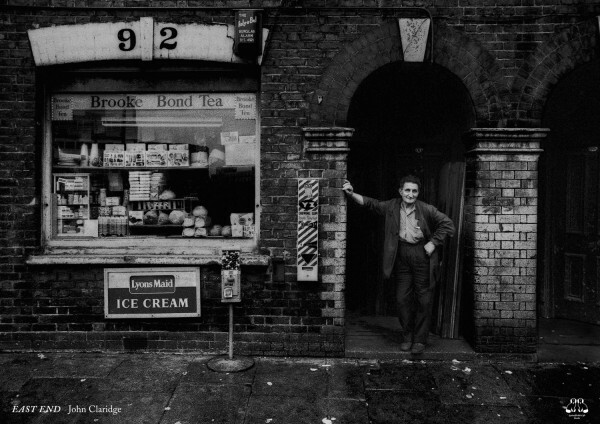 Paul recognised the shopkeeper in John Claridge’s photograph as Sammy Fisher, standing in the doorway of his grocer’s shop in Old Montague St in 1961. “He used to buy his bags off me for his grocery shop and he was very sharp – if there was only 499 in a pack of 500 he’d spot it like that. Paul Gardner’s recognition left me excited in anticipation of how many others we shall be able to identify in John Claridge’s pictures when his book is published next week. We are giving away 500 beautiful posters of John Claridge’s photograph of Sammy Fisher’s Grocery Shop from EAST END – you can pick one up free from Paul Gardner at Gardners Market Sundriesmen, 149 Commercial St, E1 and we shall be handing them out at The French House and Waterstones Piccadilly next week. The more I read about Paul Gardner, the more I think what a lovely, lovely man he is. I visited his store after reading about it in these pages and I think he was quite taken aback that someone from Australia would call in for a chat. In the past there seems to have been so many ‘characters’ (great example, Mr Fisher). Where are they all now? I think this is a refelction on todays society where we dare not be quite our selves any more. Like everything today all is becoming so standard as we become too self conscious and try to be like the next person on the list. Individuality is a prize in life. The spice of life makes the world go round [Not Square]. The book looks intruiging, so off to buy my copy .. Hear, hear, to the follow-ups idea mentioned by John. Can’t wait to see how many more folks are identified. Terrific photos! Thank you for sharing them and the stories. I was born in 1938 at 96 Old Montague St. Bombed out in 1940. Not sure whether Sammy Fisher’s shop was there in those days. If it was, it was next door but one to us. I remember so many of the shops along Old Montague St as we lived in a turning off the street . Also looking forward to seeing if there are any photos of the shops in Black Lion Yard . As kids we had our own names for some of them ” The little old mans ” and ” The little old women ” and the local sweetshops were ” Dave’s ” and ” AB’s ” . There was an old woman who sold pickled herrings out of a large wooden barrel and one day a customer dropped her purse into the barrel ! I am so pleased that John Claridge has taken these wonderful photos . Can’t wait to get my copy of the book . The Picture of the Butcher Shop in Old Montague street,with my late father and uncle standing outside. I have many memories of the shop and staying there . The shop was originally a Public House, and my late Grandfather turned it into a Butcher shop. My dad Sammy Firmin and mum Ada Firmin were good friends with Sammy and Bertha Fishoff. Our shop was the same in Sidney Street and my dad used to socialise with them as well as delivering milk and bagels etc to their shop weekly. We used to go out with them mostly on Sundays to Lyons Corner House in Marble Arch. After my dad and Sammy Fishoff passed away, my husband and I and baby daughter took Bertha and my mum on holiday to Spain with us which was about 40 years ago. It was just after Bertha took ill. They were such characters in those days.